An oil spill from a broken-down vehicle in Lornie Road caused massive traffic snarls and disrupted bus services during morning rush hour yesterday, in the fourth such incident in less than three weeks. A mobile crane had broken down and leaked hydraulic oil, The Straits Times understands. The Singapore Civil Defence Force was alerted to the incident at around 4.15am yesterday. Two fire engines were sent to the scene to clear up the spill, which affected two stretches of Lornie Road. One stretch had to be resurfaced. The closure of the stretch between Andrew Road and Wallace Way caused a jam of a few kilometres until the Woodleigh underpass during rush hour yesterday. A traffic tailback was also reported in Upper Thomson Road. A few SBS Transit bus services skipped stops along Thomson, Lornie and Adam Roads for about an hour until around 9.40am. The affected areas were closed for hours. The stretch of Lornie Road between Andrew Road and Wallace Way reopened at 12.30pm, while the second stretch on the up-ramp from Braddell Road to the Lornie viaduct was reopened at 4.30pm. In a statement sent at 4.42pm, the Land Transport Authority (LTA) said it had completed washing and resurfacing works at the two stretches of road. The National Environment Agency said its service provider was at the site to clean up the oil spill from early morning until 10.10am. The LTA then deployed a water-blasting machine to clear the spill. This is the fourth oil spill following incidents on the Bukit Timah Expressway, Pan-Island Expressway and Kampong Bahru Road between Jan 29 and Feb 2. Tarmac on the affected stretches had to be resurfaced in all three previous incidents. Last year, seven out of 1,625 oil spills on Singapore's roads required resurfacing of the roads. When The Straits Times visited the scene of yesterday's spill at 8.40am, two workers were cleaning it up using biotreatment liquid and brooms. 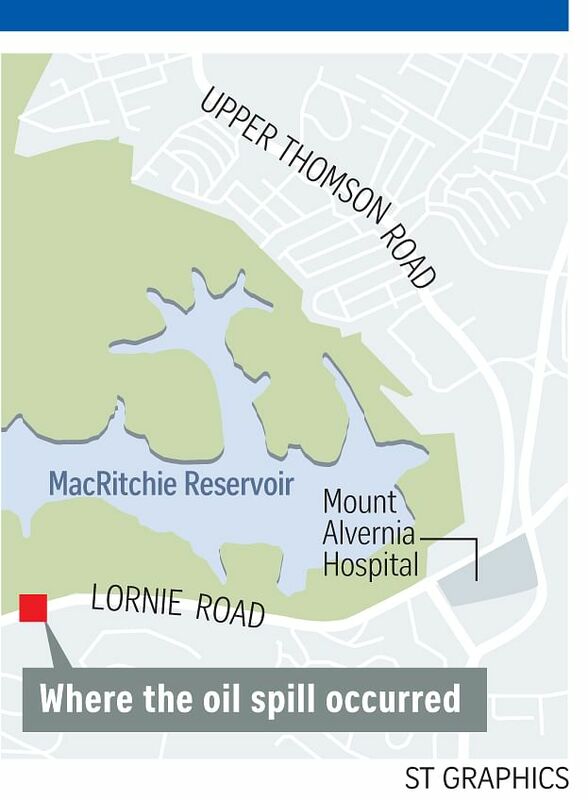 There was an oil trail of about 600m on the left-most lane of the four-lane Lornie Road, between Andrew Road and Wallace Way, and a pool of oil at an area after the MacRitchie viaduct towards Queensway, where the crane had stopped. Mr Chia Hong Ju, 30, a ship broker, saw when he was driving past at 7.50am that a part of the left lane from the start of Lornie Road at the end of Thomson flyover was closed. "I kept to the right lane and was in the (traffic) build-up for only less than 15 minutes." Mr Jeffrey Yeo, 43, an administrator who lives in Yishun, drove to work at Mount Alvernia Hospital via Braddell Road around 9am. "It was a 15-minute delay. Traffic was moving slowly but I think it was under control," he said.